Manager Sean Dyche is refusing to look too far ahead after second-placed Burnley took another step towards promotion to the Premier League. Burnley's 1-1 draw at Watford on Saturday, coupled with defeats for QPR and Derby, opened up a 10-point gap to Rangers in third with six games left. 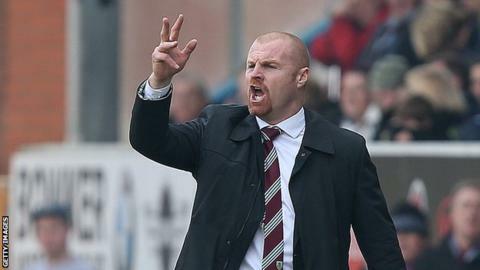 "It's important we focus on the next game," Dyche told BBC Radio Lancashire. "There's still work to do. The good news is that we've got good players coming back and that can only help." Burnley will join already-promoted Leicester in the top flight next season if they pick up nine points from their remaining six matches. Defender Kieran Trippier, plus strike duo Danny Ings and Sam Vokes, were missing with injury at Vicarage Road. Midfielder Dean Marney was also absent because of suspension, but will return for the trip to Barnsley on Tuesday. "We've had a few challenges with players missing, who have played a big part of what we've been doing so far this season," added 42-year-old Dyche. "I thought the lads' mentality to look beyond that and deliver a performance was excellent. It was a moment of real quality to make sure we got a point from the game." Ings and Trippier are both expected to play some part in the final month of the season, but Vokes will miss the rest of the campaign with a serious knee injury.